Jane Vigor was born in Graffham in 1699, the daughter of Revd. George Goodwin, the parish priest. She inherited a substantial fortune, outlived three husbands and became a celebrated correspondent from the court of Empress Anna of Russia. Jane was baptised at Graffham parish church on 20 February 1699, the daughter of the Reverend George Goodwin M.A. 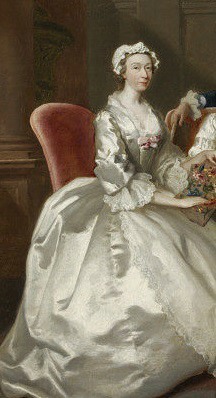 and his wife, Elizabeth, née Styles.Note 1 Jane grew up in Graffham with her older brother Richard until the family left the village in early 1709, when Jane was ten years old. The family then settled in the West Yorkshire village of Methley, about seven miles south-east of Leeds, where George Goodwin was to remain as parson for the next 40 years. On 20 November 1718, Jane Goodwin (aged 19) married Thomas Ward at Temple Church in the City of London.Note 2 Thomas was the son of Sir Edward Ward, the former chief baron of the exchequer, and Elizabeth Papillon. Sir Edward Ward is best known as the judge in the state trial of the pirate, Captain Kidd, in 1701. Jane’s brother, Richard, died in the 1720s following which she inherited his estate. According to the Yorkshire diarist, John Hobson (writing in 1726), ‘Mr. Goodwin, minister of Methley, … lost 40,000/- in the South Sea, and married his daughter to a Russian merchant, and had given her 14,000/- to her portion’. In May 1728, Thomas Ward was appointed to the post of consul-general to Russia. Jane accompanied her husband to St Petersburg, arriving in August, together with his secretary, Claude Rondeau. Jane wrote of her sadness in leaving ‘a fond father, from whose presence I had never been a fortnight in my whole life till I left him to come into a strange country’. 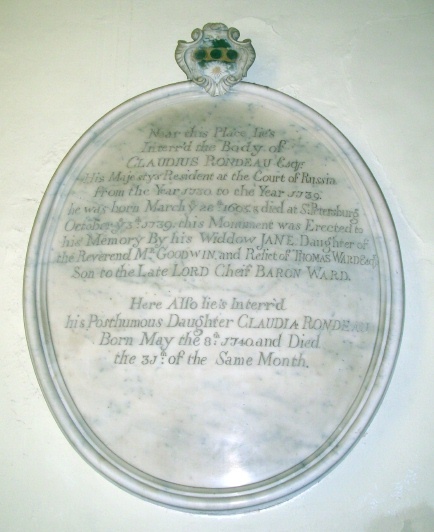 Ward died suddenly on 4 February 1731,Note 3 following which Rondeau quickly took over, not only his commission, but also his widow, as on 23 November, Jane married Rondeau at St Petersburg. Rondeau, the son of a French protestant who had settled in England, was a success in his new role serving the British government effectively, helping to reconcile the bickering factions within the Russian Company at St Petersburg. 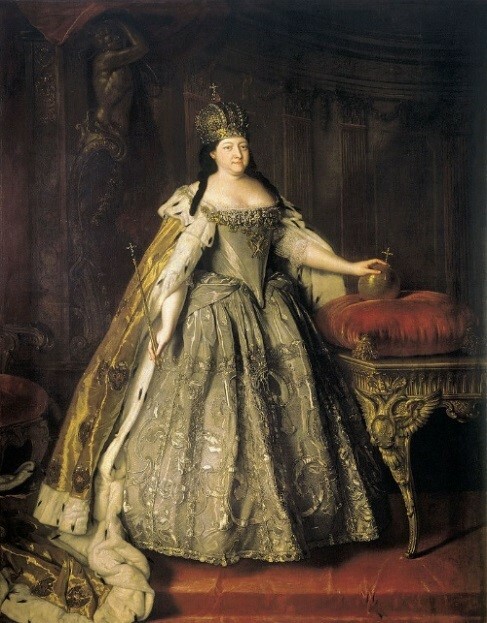 In the meantime, Jane took an active role in the Russian social scene, becoming a favourite of Empress Anna and attending various court parties, weddings etc. Rondeau was described as a ‘delicate’ man and died, probably from the effects of a cold, on 5 October 1739. Jane was now expecting her first child (some sources claim that she had previously had another child that died in infancy) and decided to return to England. They travelled over 550 miles through the region of Livonia and the Duchy of Courland (now part of Latvia) before reaching the port of Memel (now the Lithuanian city of Klaipeda) on the Baltic Sea. At this time, Memel was in Polish Prussia and the port was full of Prussian troops. The party spent their first night in the only accommodation that they could find, an inn crowded with noisy soldiers and officers. On the afternoon after their arrival, Vigor went into the town to visit merchants and other prominent citizens. In conversation with a Mr Meyer, Vigor explained their problems and enquired if Meyer knew of any accommodation more suitable for a lady in Jane’s condition. Meyer replied that he knew of some apartments that were available, which he described as ‘commodious’. While Vigor continued with his business meetings, Meyer sent a note to Jane in which he offered the apartments, hoping that she would ‘find every accommodation that she could desire’ adding that ‘the sooner she came, the better’. Immediately, Jane’s servants were ordered to get everything ready and, as soon as a coach could be procured, they set out for the apartments. On reaching the apartments, Jane found them to be spacious and stately and they were treated to everything they could require. After supper, they discovered that the apartments were actually the home of Mr Meyer, who was out for the evening. The following morning, they were greeted at breakfast by Meyer and his son. Jane thanked Meyer for his kindness, but at the same time told him how much she was embarrassed, as she was unable to offer anything in return. Meyer begged Jane and her friends not to worry on that account, adding ‘All I do is return it as a consequence of favours received, so that your debt is cancelled before it is incurred’. ‘His name, madame, ‘ came the reply, ‘was Goodwin’. The following day, Meyer sent for his daughter to keep Jane company. The two ladies soon became friends and the daughter invited Jane to remain with the family until after her confinement. Jane, however, was anxious to return home and, after a few days ‘she was obliged to leave this grateful and hospitable family’. Together with William Vigor, Jane resumed her journey, travelling through Königsberg and Danzig (now Gdansk) to Hanover, where they spent a few days, before travelling on to the port of Helvoit (now Hellevoetsluis) in Holland, from where they were able to obtain a passage to England. Jane and William Vigor were married at Somerset Chapel in the parish of St Mary le Strand in Westminster on 4 May 1743. The priest who officiated at the wedding was the Revd. Thomas Newcomb who was rector at both Stopham and at Barlavington (three miles east of Jane’s birthplace), and previously a curate at Petworth. Jane and her third husband seem to have settled into a life of genteel obscurity, although William occasionally represented Prankard and Dickinson’s interests in London. After a few years in London, in 1749 the couple settled at Taplow House, in Berry Hill, near Maidenhead. Described as ‘a substantial property with stables, garden, orchards, and several acres of arable land and meadow’, Taplow House was situated in an area popular with many Quaker families, including William Penn, founder of Pennsylvania, who is buried at Jordans Friends’ Meeting House, about an hour’s ride away. Her obituary by John Nichols in the Gentleman’s Magazine described Jane as having ‘lived much in the world, and being well acquainted with books, her conversation was the delight of all who had the pleasure of knowing her’ and that that her loss was ‘severely felt by the neighbouring poor, amongst whom she was constantly searching after proper objects for the exertion of her charity and benevolence’. Another English resident of St Petersburg described Jane as ‘a fine woman; very tall, and perfectly genteel’, and ‘in all her answers, even to her inferiors, she shows the greatest condescension, and most obliging temper’. In about 2016, the Victoria & Albert Museum in London accepted a group of 22 sofa and chair covers embroidered by Jane Vigor, together with a ‘conversation piece’ by Joseph Highmore (1692–1780), in lieu of an Inheritance Tax liability. The painting (above) shows Jane (on the left) and her sister-in-law, Ann, and their husbands, William Vigor and his elder brother Joseph (both standing). 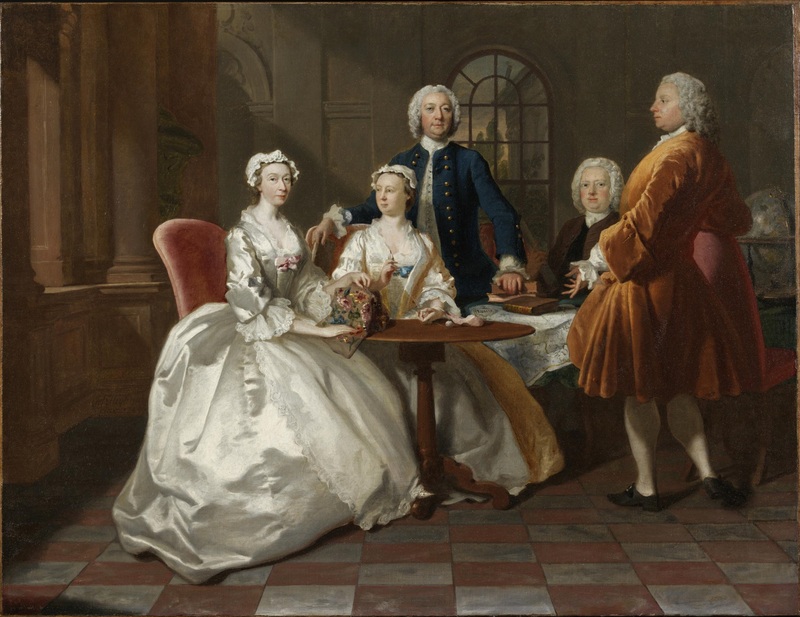 The third man (seated) in the painting is probably John Penn (1700–1746), son of the founder of Pennsylvania, with whom the Vigors were close friends. In the picture, Jane is holding an example of her embroidery, while Ann is knotting silk thread with a shuttle. 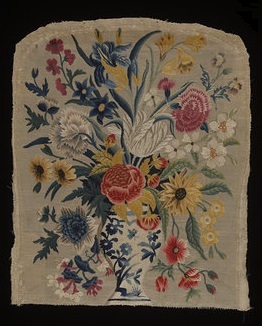 The group of seat covers held by the V & A are embroidered on an unusual worsted ground and it is possible that they were worked by Jane while she was in St Petersburg, adapting Russian materials to her English design and needle skills. Her letters make several references to her working at embroidery, as an English practice that caught the attention of the Russian Empress Anna, and undertaking projects of an extensive scale. The cover in the picture has a design of a wide variety of flowers in a blue and white Chinese-style vase. During her eleven years in St Petersburg, Jane wrote regularly to her friends and family in England. 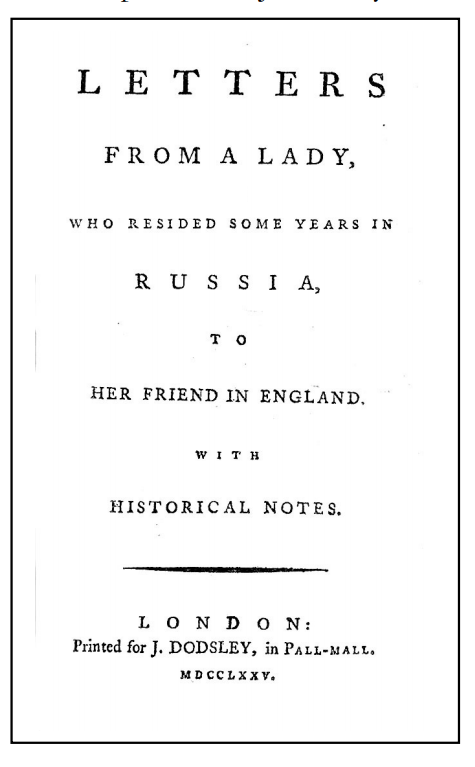 In 1775, a selection of her letters was published under the title Letters from a Lady, who resided some years in Russia, to her Friend in England. With historical notes. In the Gentleman’s Magazine, John Nichols states that ‘she was in a manner obliged to publish, to prevent a spurious and incorrect copy from being obtruded on the world’. The letters were favourably received and were translated into German, French and Dutch by 1776, with a second English edition being published in 1777. In 1836, the letters were translated into Russian; this edition was considered unsatisfactory, being heavily censored, and a completely revised edition was published in 1874 by Eugene Karnovich. Jane’s letters were highly valued by historians as a source depicting Russian society during a period of transition in the mid-18th century. In 1784, after Jane’s death the previous year, some more letters were found among her papers; these were published under the title Eleven additional letters from Russia, in the reign of Peter II. By the late Mrs. Vigor. Never before published. The preface states that these letters were ‘found among her papers since her decease’ and include a short biographical preface and some historical notes. These letters precede the originals chronologically and cover her earliest years at St Petersburg, and were more personally revealing than those she had published during her lifetime. Jane’s letters offer a unique eyewitness account of life at the court at St Petersburg and amongst the expatriate community; contemporary reviewers praised the anecdotes of courtly occasions, including marriages, coronations and funerals, as well as stories of aristocratic intrigue and romance. 1. The biography in the Oxford Dictionary of National Biography incorrectly claims that Jane was the daughter of the Revd Edward Goodwin of Rawmarsh Hall, Yorkshire, and Jane Wainwright. This claim is repeated in several other sources. 2. The preface to Eleven additional letters from Russia published in 1784, the year after Jane’s death, includes some biographical notes, which state incorrectly that she was married ‘to Thomas Ward, Esq. Consul General to Russia, 1728’. This assertion that Jane married Ward in 1728 is repeated in every subsequent article about Jane. ‘England, Marriages, 1538–1973’ (published in 2013), however, includes a record of Jane Goodwin marrying Thomas Ward at Temple Church on 20 November 1718. 3. Prior to 1752, the civil or legal year in England began on 25 March (Lady Day). As a consequence, the death of Thomas Ward was recorded in contemporary records as being in February 1730 (i.e. 1730/31) whereas the modern equivalent is February 1731. Victoria and Albert Museum: A group of 18th-century embroidered sofa and chair covers and a related conversation piece by Joseph Highmore.